Here's the last video Mike and I recorded a few months ago when we had access to the high speed camera. Synchronizing the camera (which can only record for about a second) with the destruction is always tricky, but we did really well on this one and also the video is not quite what you think it is. I also created a page with all of the videos in one place: Tom and Mike's High Speed Movies. Nice background on the movies page. fung shue. Oh yeah, I forgot to mention how rad the web design is. Good fun. Thanks for posting these. 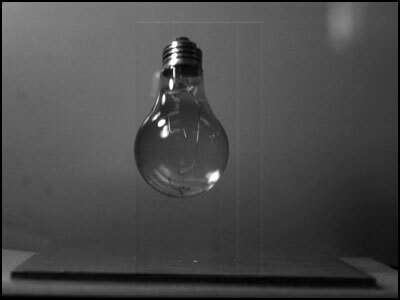 On a couple of the movies (bulbdrop, waterplate2), there appears to be liquid scattering with the other objects. Is there liquid? If so, why? If not, what am I seeing? Also, what kind of camera did you use? Wow, those are really nice!